Grammy Award-winning vocalist and composer Susan McKeown brings to our stage a truly memorable show. Performing selections from her new CD, Singing in the Dark, Susan explores, through song, the theme of creativity and madness. Setting music to words by poets of the last thousand years who, for the most part, were writing through the lens of depression and substance abuse, Susan brings to life the words of artists like Byron, Gwendolyn Brooks, and Nuala Ni Dhomhnaill, as well as songs by John Dowland, Violeta Parra, and Leonard Cohen, backed by guitarist Ryan McGiver, Eamon O'Leary on bouzouki and banjo, and bassist Jason Sypher. Lauded by the Boston Globe for walking "on the wild side of Gaelic melody," Dublin-born Susan is a singer of passion and grace. 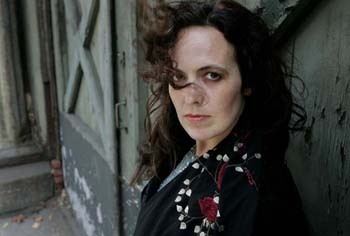 Born and raised in Dublin, Susan moved to New York City in 1990, where she forged a creative path that blurs the boundaries between traditional Irish music and edgy, eclectic contemporary songwriting. One of the most expressive voices to have come out of Ireland, Susan's rich contralto is deepened by a distinctively adventurous, primal sound. Rolling Stone described it quite well when they said: "McKeown grabbed both song and audience by the throat, dragged them through heaven and hell and back again, and left the stage to the loudest applause heard all evening." As part of the Chamber Folk Series, a year long set of conversations with notable artists, we start off this evening with a pre-show question & answer session with Susan, moderated by Peter Glazer, Theater, Dance and Performance Studies Department Chair and Associate Professor, UC Berkeley.